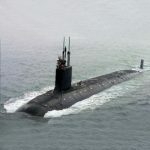 U.S. Navy Rear Adm. William Merz, head of the Defense Department‘s submarine warfare office, and other branch officials are looking to add more unmanned vehicles into the country’s undersea force, Navy Times reported Thursday. David Larter writes autonomous drone developers have faced challenges in the collection of data from unmanned underwater vehicle sensors such as commercial fishing nets. “I hope unmanned systems get there eventually but until then, give me what you have and I can plug holes that can unburden the [attack submarine fleet],” said Merz. Vice Adm. Michael Connor, former head of the U.S. submarine forces, told Congress that UUVs can help guard select areas of the cable system to help free up attack boats for other tasks.